Notes: The entirety of the Sailor Moon series was originally discussed in a single review, which will be duplicated under each title heading, with individual ratings per series. Although it predates Tim's review, since Tim's review individually reviews each season, it gets first opinion status. Based on the manga by Naoki Takeuchi, which originally ran in the magazine Nakayoshi from 1992 to 1997. Tsukino Usagi is your normal, everyday, 14-year-old, stereotypical dumb blonde. Her life is suddenly changed one day after a chance encounter with a talking cat named Luna. Luna gives Usagi a magical brooch, and reveals to her that she is the legendary pretty soldier of justice that she has been looking for. Queen Beryl has returned and seeks to conquer the Earth, a feat she was denied hundreds of years ago by the Moon Kingdom. And so the story begins... a story that has become the most well-known anime series of the last decade. I admit to this right now: I am the original "Moonie". I remember when I first saw this series back in 1992, when I first happened upon an article on this "up-and-coming hot series" in an Animage. Little did I know then how this series would literally change the world of anime fandom as I and the world knew it. It all seemed innocent enough. The original series is a fun, if slightly childish romance, which had all the elements to make a successful magical girl show without being stereotypical. Seeing a group of 14-year-old girls go into battle with ridiculously altered versions of their school uniforms was both charming and hilarious. The animation quality was surprisingly good for early '90s TV animation, though not the best. The Japanese soundtrack was catchy and captured the mood perfectly. It even had a neat story to boot, alluding to past lives and reasons behind their reincarnations. Even then, I don't think anything could have prepared us all, and especially Takeuchi Naoko, for the impending blitzkrieg that this series would become. Sailormoon truly has something for everyone. It has exciting fight scenes for the action fan, just enough romance, and truly memorable characters you come to care for very deeply. What makes this show such a standout is that it originally focused more on the characters themselves than on the obligatory Monster-of-the-Week. Specifically the character of Usagi. Usagi was NOT your standard magical girl. In most previous magical girl shows before, the heroine was given magical powers, but primarily told to have fun with them, and do as they please, which was why in so many of those shows, they would transform into models and idol singers. They got to live out their dreams. For Usagi, it is a dream deferred. In modern Japanese society, young people are told to shut up, study, take their tests, and get a good job. You can worry about dreaming only after you've settled down, have a set career, and made your fortune. Usagi wants nothing more than to hang out at the video arcade with her friends and flirt with cute guys, like any young girl would. Yet now, she now has this familiar nagging her to be a better fighter, telling her the fate of the world rests on her shoulders. She is being forced to grow up when she should be revelling in her childhood. What Japanese child, or any teenager for that matter, -wouldn't- relate to that? By the end of Sailor Moon R, she was rewarded for toughing it out ... the world was saved and her dream came true. She was allowed to be young forever with the one she loved, and not be denied a family in the process. And the story should have ended there. But unfortunately for Usagi, and the rest of us, it didn't. By the end of R, Sailor Moon had become such a huge hit, and nobody wanted it to end. Fans and producers alike wanted more adventures. So then came Sailor Moon S, which introduced the "Outer Senshi", as well as more villains for her and her friends to fight. While still fun, it was starting to deviate from the story of Usagi, and focused more on the weekly villain. It was starting to stretch itself too thin. SuperS tried to set up a continuation of the heritage based, not on Usagi, but her future daughter, Chibi-Usa (Little Usagi), but it fell quickly into the formula of magical girl show as previously known. Chibi-Usa seemed less to be training for the future, but blowing off steam by adventuring because she thought the peaceful future was boring. The franchise was obviously faltering, so the producers decided to do a total makeover of the series. Thus, we have Sailor Stars, which not only reinvented the entire purpose of Sailor Moon, alienating the Japanese fandom, but revealed Usagi wasn't the main focus of the series after all, but Sailor Galaxia. Not to mention the gender-shifting Sailor Stars themselves, who according to previous storylines, should never have existed anyway. This was the end for the TV series ... but the marketing blitz continued elsewhere. Specifically, here in America. At the time the series was breathing its last in Japan, it was being reborn for the North American market. DiC's surprisingly faithful dubbing (including keeping most of the names as close to the original as possible without sounding manufactured) caught everyone off guard, and became an instant underground hit. The original run of the show did not last long, but a successful campaign by American fans prompted DiC to rerun and expand its run of the series. (And yes, this dub did result in the current Reviewing Editor's fandom, and he'll readily admit it.) This series has brought a lot of attention to anime fandom in general in North America, especially the United States. But only time will tell if the effect will be positive or negative. 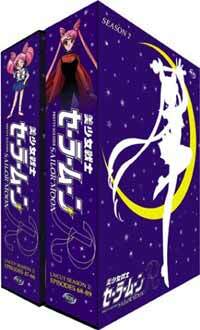 Sailor Moon IS one of the better series to come out of Japan in the last decade. It truly deserves its popularity. It appeals on such a wide level that a family can sit down to watch the show, and all can find something to enjoy in it. Although the music in the North American dub is flat, unoriginal, and basically standard kiddie fare (read HOKEY), and the cringeworthy "Sailor Says" segments seem to be conjured out from nowhere to pass the show off as educational, it IS educational, but through the interactions between the characters rather than a 30-second blurb about crossing the street without looking. At its heart, Sailormoon is the story of a girl striving for the balance between duty and life itself. But it loses itself in the process. The real tragedy of Usagi is that, quite possibly, her fans love her too much. The series is suffering backlash it really doesn't deserve, because the quality of the later series really does not compare to the first two seasons. And limiting anime fandom to only this show, as so many Moonies do, is a disservice to the entire medium. Sailormoon is not the be-all, end-all of anime, as so many want to believe. Funny enough, maybe it could've been, if it hadn't been so popular.